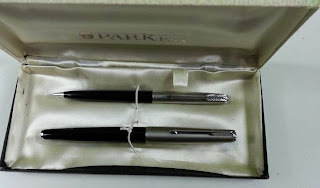 I bought a Parker 61 capillary filler fountain pen and pencil set that looked like new. (I wrote a brief post about this back in June 2014.) Even the silicone coating on the filler system is perfect with no flakes or scratches. However, I couldn't keep it writing; the flow was so dry. No doubt it needed to be cleaned well, but I'm not willing to risk taking it apart after reading how easy it is to break them. So, I've flushed it out with a bulb syringe several times and refilled with different inks to try to improve the flow. This has only been partially successful and has improved marginally by using increasingly wetter inks. Until recently the best ink combination for this Death Valley dry writing 61 was Waterman Serenity Blue. But even that was not a great solution - no pun intended. Obviously there must be some residue blocking the flow that I haven't been able to clear out and I was about ready to give up on it. However, recently I was reading about intense blue inks and ran across a review of Levenger Cobalt Blue in which it was noted that one of the problems with this ink is that it bleeds and feathers so badly because it is such a wet ink. 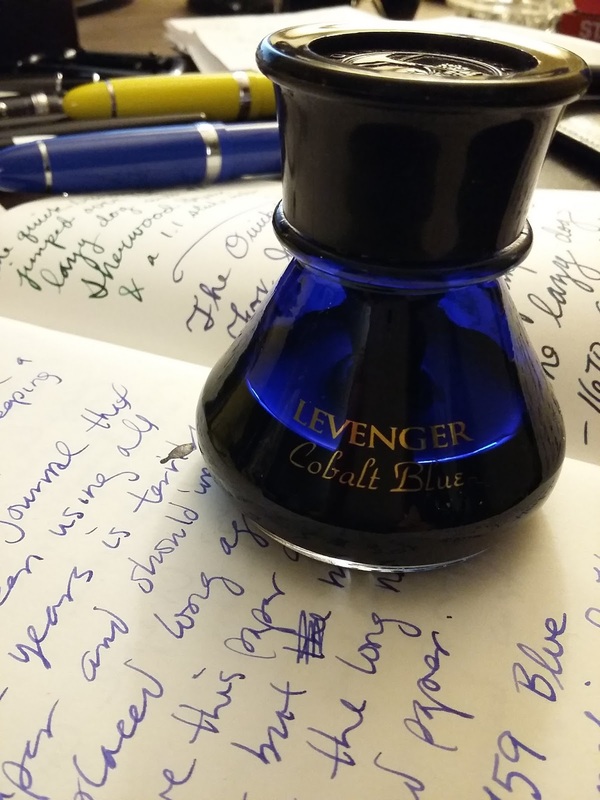 Since I have a bottle of Levenger Cobalt Blue, I knew this to be true and was the reason why I stopped using it even though I love the color. 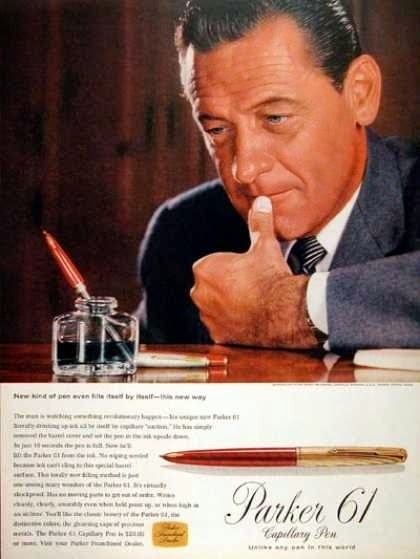 Then it dawned on me that Cobalt Blue might be wet enough to flow through my Parker 61. 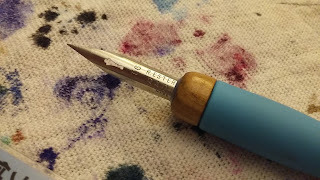 So, I cleaned it thoroughly with the bulb syringe and after expelling all of the water, I dunked the Parker 61 filler into the Cobalt Blue ink. Afterwards, I tried writing with it and there was no ink flow at all. Out of frustration I put the empty syringe on the end of the filler to see if any ink was in the pen, because I then wondered if the capillary system wasn't picking up any ink. I squeezed it and ink came out of the nib. So, I dipped the filler back into the ink bottle and then reassembled it to try it out. Amazingly, it wrote the best it ever has so far. It still is a dry writer and feels a bit like writing with a soft pencil, but not as dry as it had been in the past. The next morning I took the cap off to try it again thinking it will surely have stopped flowing or skip as it has in the past. Instead, I was pleasantly surprised to find it still wrote just as well. The next day it is still writing easily with no skips, drag or false starts. While this doesn't completely solve the partial clogging, it at least has the pen working at an agreeable and very usable flow. It is funny that an ink and a pen - both of which I had given up on - have turned out to be the perfect combination! Some new pens are stubborn to get started, especially using an ink cartridge for the first time. New pens may have residue from manufacturing that make them difficult to start. 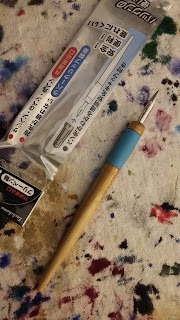 So, washing the nib with mild soap and water can help them flow better. Dipping pens and filling them with bottled ink primes the feed. If you only have cartridge ink, try tapping the pen nib GENTLY on a paper towel or rag to start the flow. You might also need to gently squeeze the ink cartridge JUST A LITTLE to start the flow. If you squeeze too hard you'll have a mess. Once you do this the first time and have ink running through the pen from cartridge to tip, you shouldn't have to do it again, especially if you use the pen on a regular basis. If the pen and cartridge run dry and are left sitting for a while, you may have problems again. If you still have problems, try a different brand of ink. My favorite ink for pens with a stubborn flow is Waterman's Serenity Blue. Serenity Blue flows well. It doesn't dry in your nib as quickly as other inks, and it has a beautiful bright blue color. If your pen has had ink for awhile and clogged, a syringe is really helpful to clean out your pen quickly. Flushing the pen several times with lukewarm water nearly always brings your pen back to write-like-new condition. When I flush a pen, I stand at a sink with a glass full of clean water, drawing the water out with the syringe. Hold the syringe firmly into the pen nib assembly and force the water through, pointing the nib down toward the drain so the inky water is less likely to splatter on you or counter top. Even if you hold them together tightly be prepared to get sprayed. The nib should be flushed several times until you see clear water coming through the nib. After the nib is clean, use the syringe (empty) to blow air through the nib assembly to help it dry faster. The nib will need to dry - usually overnight - if you want the ink to be full strength. If the nib still has water in it when you re-assemble it, and fill it with ink, the ink will be diluted. Surprisingly, even the tiniest bit of moisture will dilute the ink noticeably. If your pen still has ink flow problems after cleaning, then you'll need to take apart the nib assembly, remove the feed, and clean the nib and feed with soap and water. When you do this, examine the channel in the feed for ink residue. Use a toothbrush or toothpick to clean out the channel, being careful not to damage the feed. 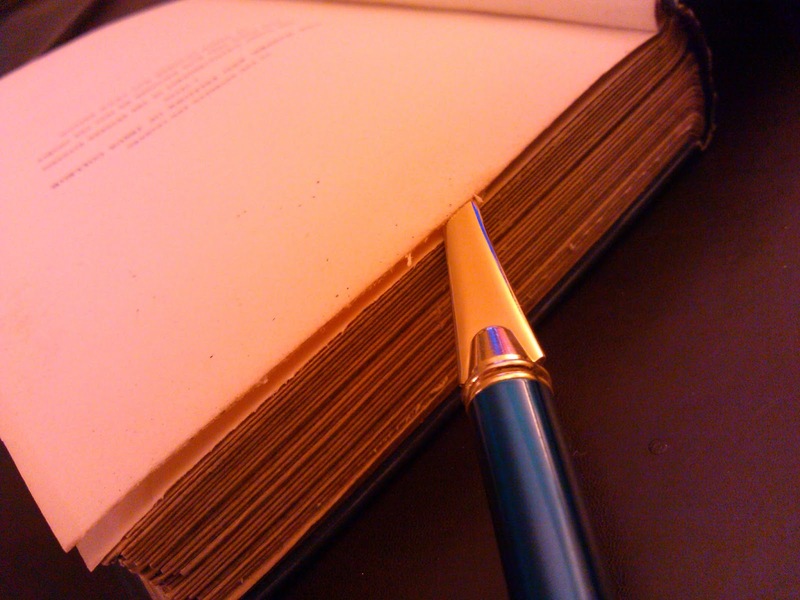 The feed must be clean and the channel open in order for your pen to write well. Some of the better pen and ink dealers sell small copper sheets that can be used to clear the feed channel, even when the pen is fully assembled. [PHOTO - left to right: International Short, Jinhao International, Waterman International Long cartridge. Most of my fountain pens are filled from bottles of ink. 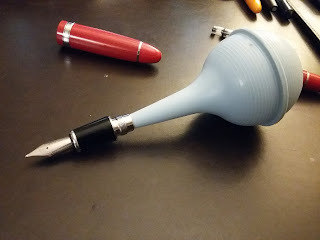 However, when I am away from home or office and not certain my pen will last through the day without a refill, I use a pen with a cartridge. 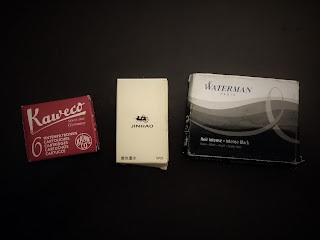 Ideally, that will be a Waterman long international, which fits in my Waterman Carene, Levenger Truewriter and Jinhao 159/x750, among others. Most pens that will hold a long international cartridge will also hold two shorts - one installed and one in reserve. Frustratingly, this is not always the case. What drives me crazy is the number of pens that are only a few millimeters shy of holding two shorts or a long international cartridge! 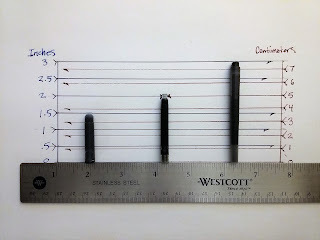 Dear fountain pen makers: Does it never occur to you to test that before you put them into production? 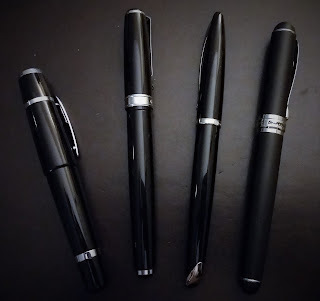 Way back when I first began collecting fountain pens, I was impressed by how smart that was that you could always have a spare cartridge in reserve inside your pen. But the more pens I collected the more I was surprised that was not the case. That irritation faded into the background the more I used piston-fillers, pneumatics, bladders, capillaries and converters. One of my favorite pens - a Taccia Portuguese is about the length of a pocket pen and writes perfectly, never drying or clogging, and no false starts. That makes it a perfect candidate for carrying around all day. Except that it is too short for an average length converter. One short international converter is all that it will hold. Until now I have used a plunger style micro-converter, which probably holds less ink than even an international short cartridge. And since the Portuguese is a wet writer, it doesn't write long before needing a refill. The metal band at the bottom of the body prevents it from being converted to an eyedropper fill. So, it has always stayed home in spite of its portability. Until today, when an order from China arrived that I had forgotten about: 5 packages of JinHao cartridges (25 cartridges) for less than three dollars and FREE shipping! The price was great, but even greater was the realization that they were medium length cartridges - a length between short and long international cartridges. This is a cartridge volume that appears to compare to that of proprietary cartridges like those of Lamy and Pilot. Unfortunately, I don't know the actual volume by comparison. But really, I don't care - I'm just thrilled to have an international cartridge that will last longer in those pens too short for long cartridges. Especially, my Taccia Portuguese, which can now become the awesome pocket pen it always was meant to be. The Esterbrook Radio Nib #914 combined with Tachikawa Comic Pen Nib Holder, Model 40 (T-40) is a great combination for drawing. The nib was found on eBay and the holder on Amazon. The two together were less than $20.00. 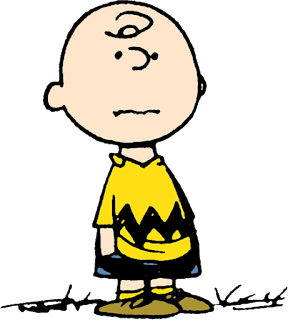 The Radio Nib is supposedly the one that Charles Schultz used to draw Peanuts. This nib is long and flexible and easily provides a variable line. It is easy to see why it was Charles Schultz's favorite nib. The Tachikawa nib holder is made from wood and has a soft band that keeps your fingers from slipping and makes the pen very comfortable to hold. The Wenger Junior Zippered Padfolio makes a great portable stationary kit, with room for four pens, stamps, pad and address book. 1. Interior pocket is large enough to hold a small Kindle. 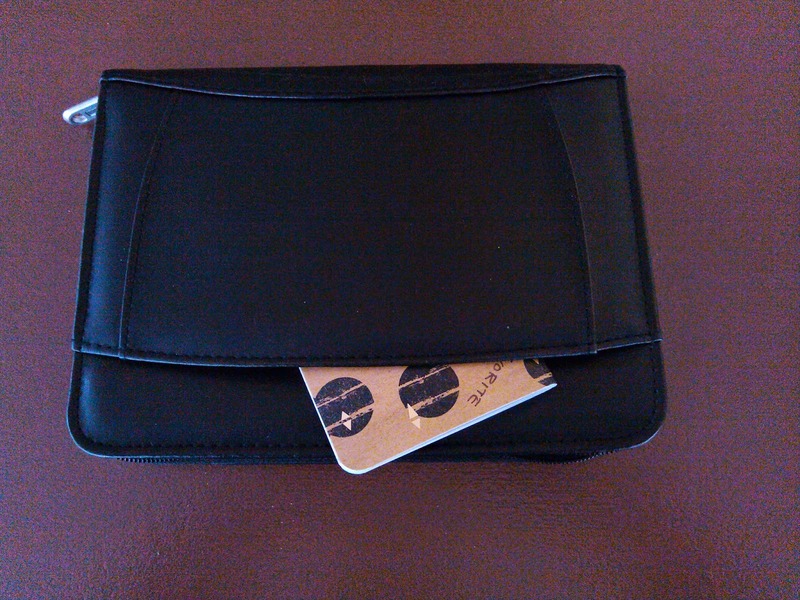 It also has pockets for credit cards and drivers license. 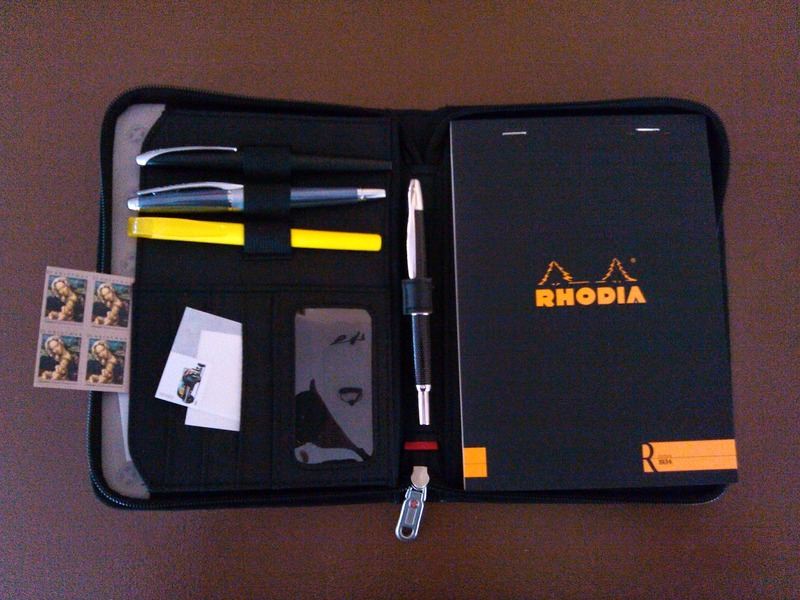 The Padfolio comes with the smaller white lined pad pictured below (#3), not the Rhodia pad. The folio appears and feels well made; constructed with "Ultrahyde", (a form of bonded leather that looks and feels like real leather) on the outside and synthetic materials on the inside. The zipper is sturdy and pulls open and closed easily. 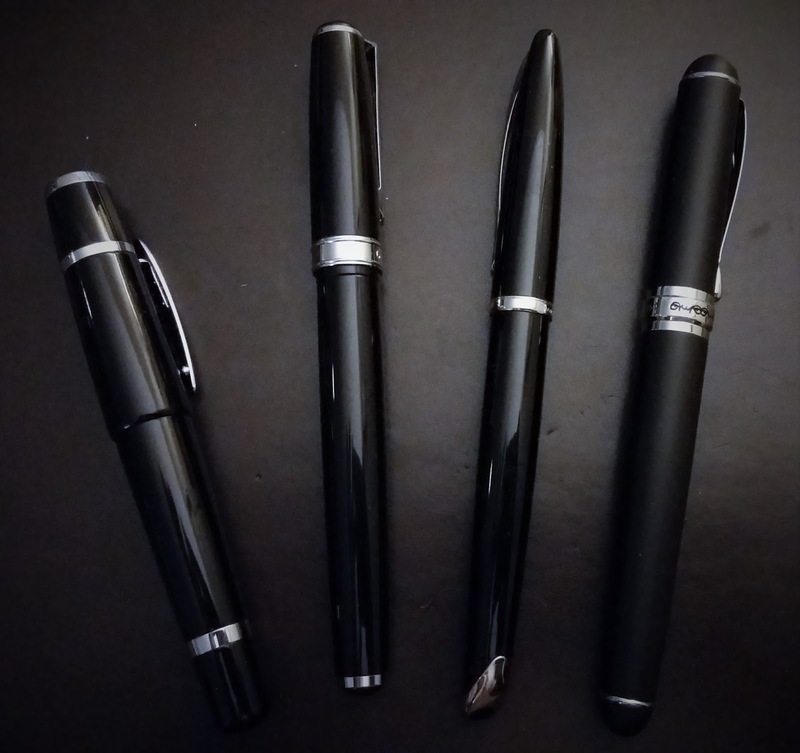 The pen loops comfortably hold full size fountain pens. The pens pictured are a Cross ATX, Cross Apogee, highlighter and Namiki Vanishing Point. All that combined with the Kindle is a bit too much (#1), but it will all zip closed. Without the Kindle, it zips closed easily (#2). 2. A Rhodia No. 16 tablet fits snugly. 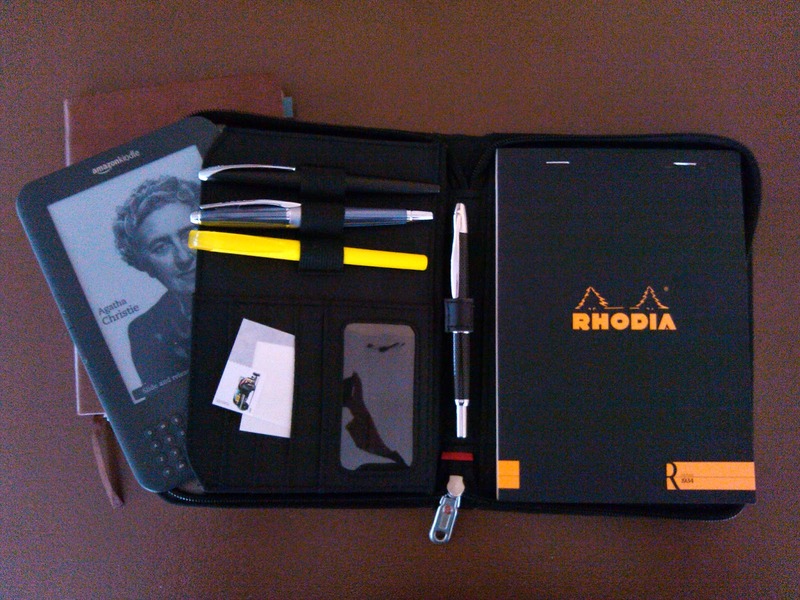 A Rhodia No. 16 pad just barely fits and is considerably larger and thicker than the stock pad. 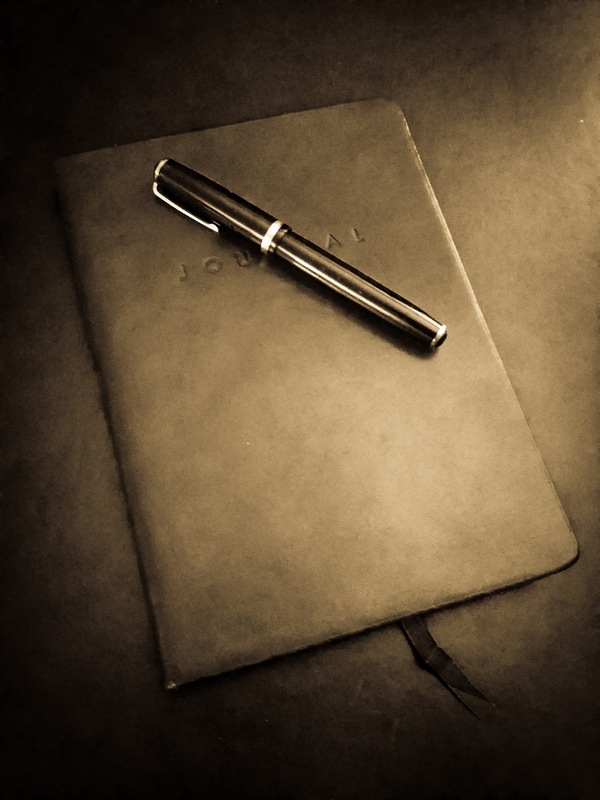 A book-bound style pad, such as a calendar, Circa Junior (Levenger) or composition book will not slide in securely. The fabric slot for the pad only works sliding in from the top; that is it is horizontal to the Padfolio, and there is no vertical slot. 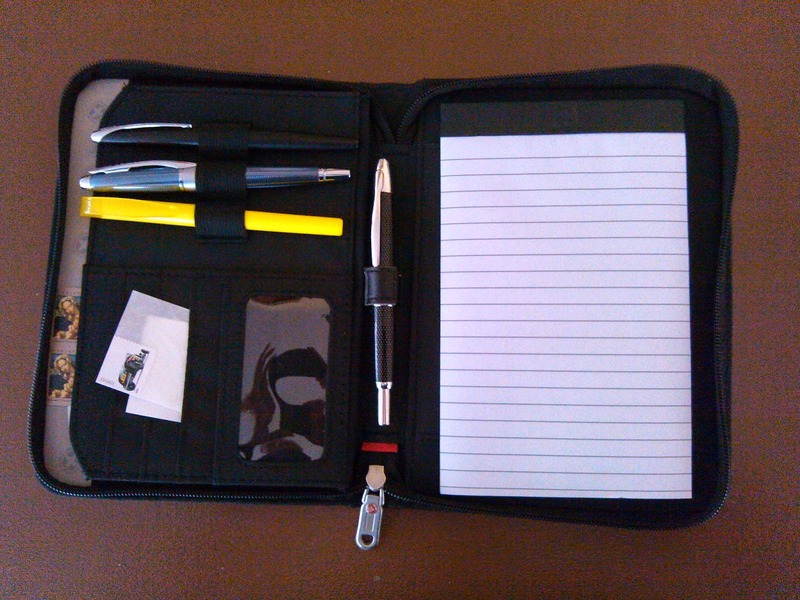 The interior pocket is roomy enough for a set of thank you cards and envelopes. 3. Padfolio with stock pad of paper. The cover pocket does not zip or snap closed, but is great for stuffing in a small address book or small envelopes (#4). The address book pictured here would actually fit in all the way but was pulled out a little for the sake of the photo. 4. Padfolio includes one pocket on the outside. At about $17.00 on Amazon (that includes shipping), the Wenger Jr. Zippered Padfolio is a great value for a leather(-ish) case, and compares well with genuine leather cases I have seen for as much as $95.00. Time will tell if it lasts well. 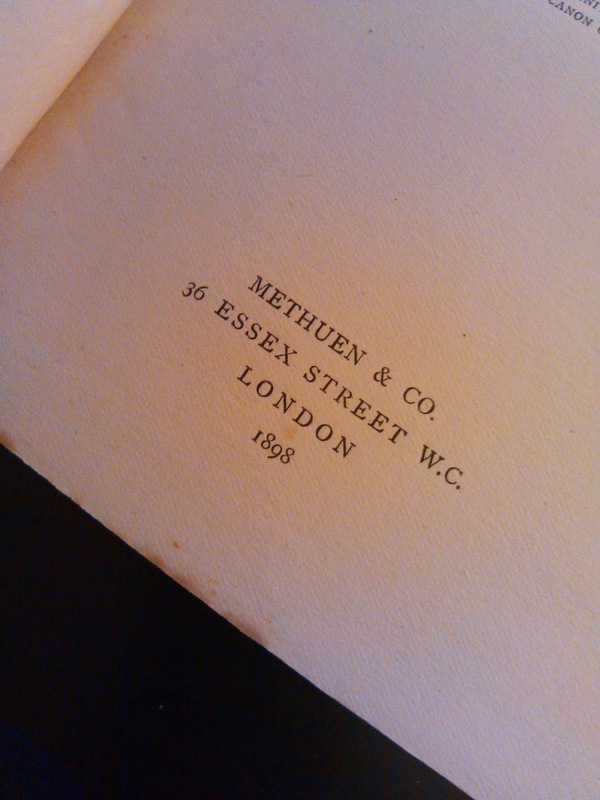 How can you have a brand new book from 1898? Well, when you order it from Abe Books and it comes to you with not a single page cut! Books in the past were bound in folio form with larger sheets of paper folded and sewn into the binding, which meant the pages had to be "opened" (cut) to be read. In the nineteenth century, books were being trimmed before they were bound, but some books were left uncut for the more refined readers. A brief article and video about this appears at Abe Books here. I enjoy reading books on Kindle, if it is a book I am reading cover to cover, but I prefer reading reference books and non-fiction books the traditional way - because I like to quickly skip around as I am studying or researching a topic. The other problem with Kindle books are footnotes - especially from old books. 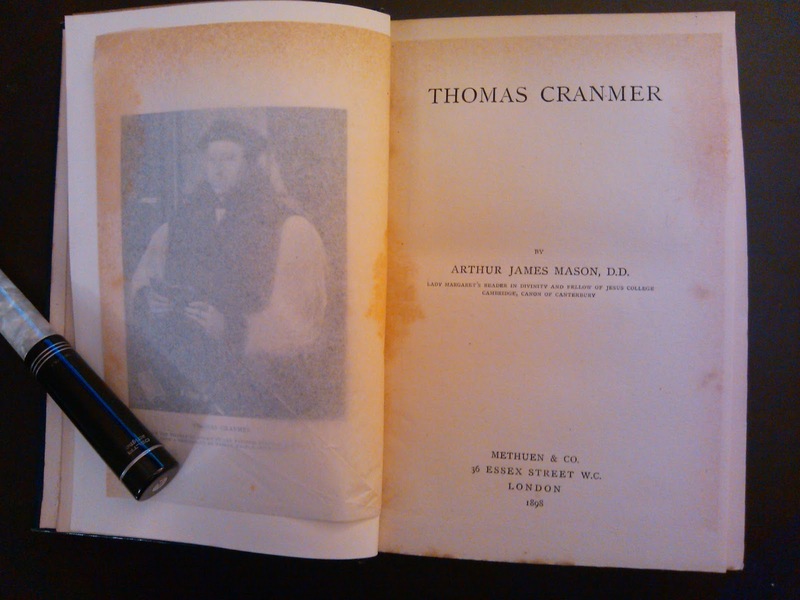 Several months ago I began reading the biography of Thomas Cranmer (Archbishop of Canterbury under Henry the VIII) by Arthur James Mason. It was one of those free, or nearly free, Kindle books with awkward formatting. While reading, the footnotes appear in the middle of a sentence with a few odd characters thrown in. I can handle that OK, but it is often difficult to match up the footnote with the originating text. Not a problem, if I wasn't interested in that point. But if it did pique my curiosity, I found myself wasting a bunch of time trying to find the source. After several episodes of that, I decided to go to abebooks.com and see if I could find a used copy. I prefer hardbacks if I can afford them, so searched for that first. Surprisingly, I found a nineteenth century copy from England purported to be in very good condition, and it was just about the least expensive copy available. 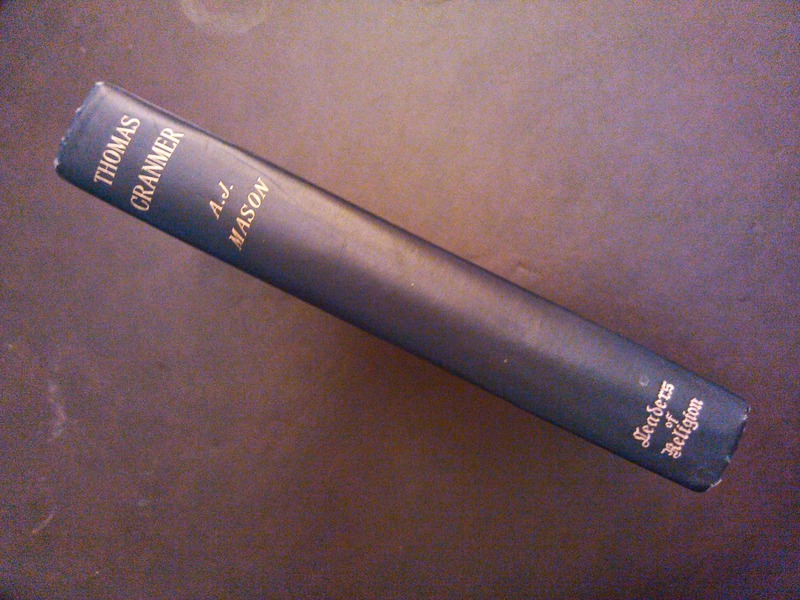 When it arrived I was pleased to see that the cover was in excellent condition. 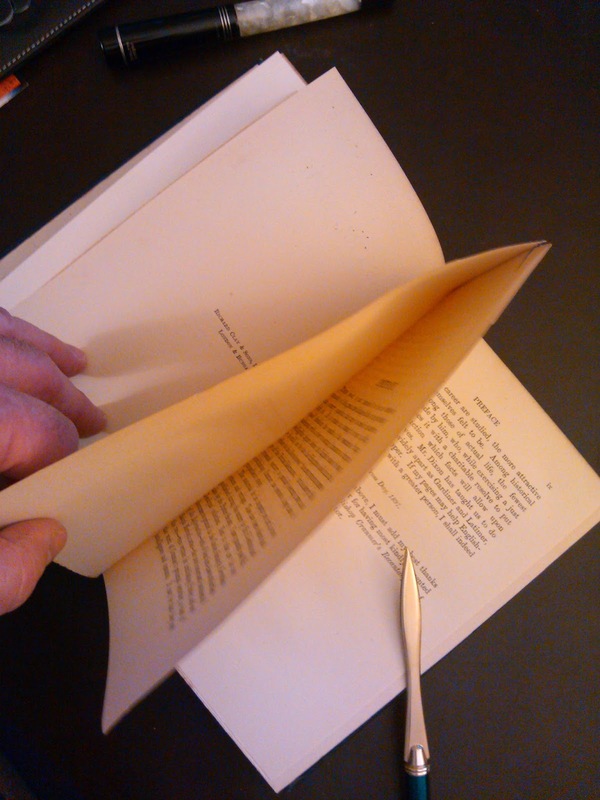 However when I opened the book up I realized that not a single page had been cut. 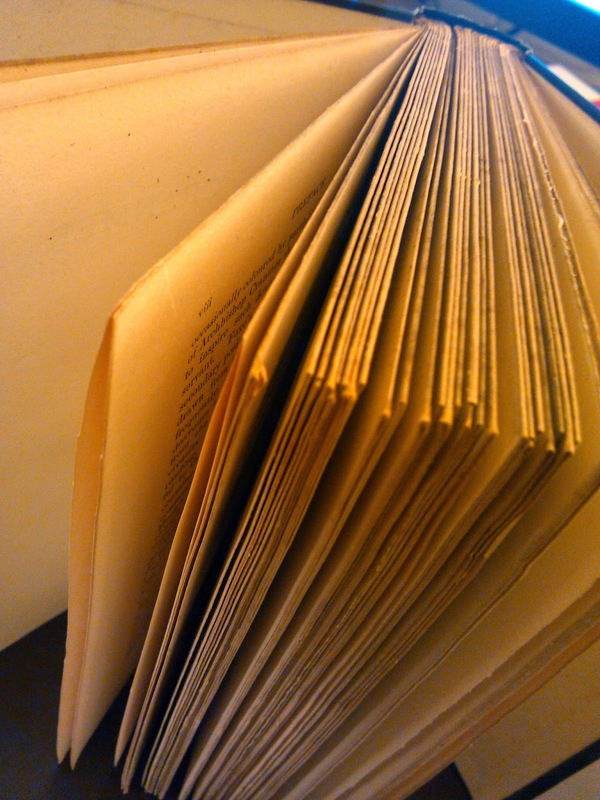 The book is 116 years old and it has never been read! You might respond, "No kidding. 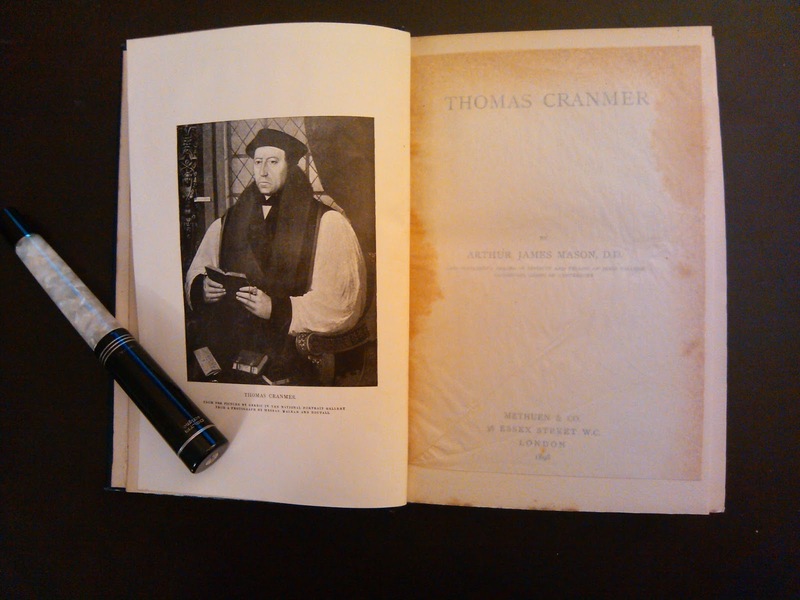 It is a book about Thomas Cranmer. No wonder no one read it!" 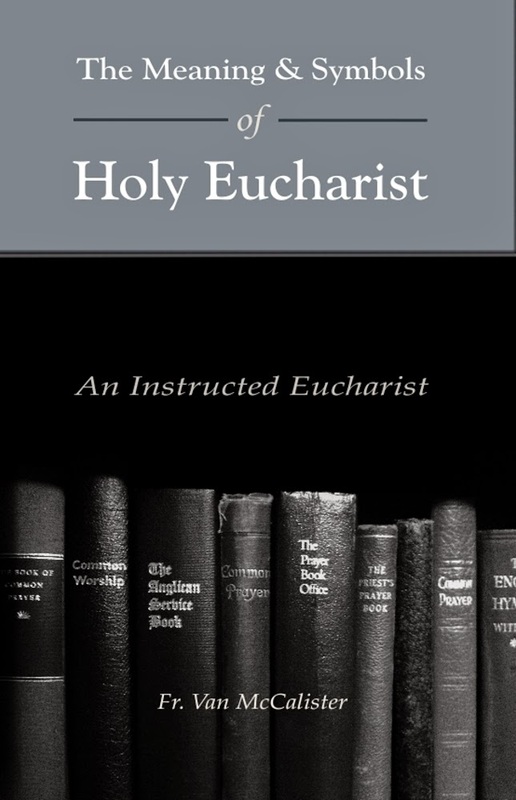 I get it, but it is actually a very well written history book, and I am Anglican. So, I love it. The crazy thing is, I am so pleased with the idea of having a new uncut book from 1898 that I can't bring myself to cut it!